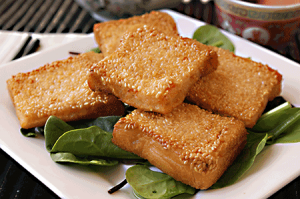 The art of Chinese cuisine consists of the combination of Ying & Yang, opposing elements like our meat and vegetables. This makes our food healthy and well balanced. Photos: Food props and side portions are not included in the price of main dish. £7.10 排骨 Barbequed Spare Ribs. 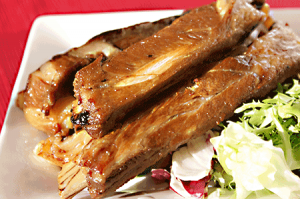 An aromatic starter where traditionally prepared spare ribs are freshly spiced to taste then barbequed. An appetising starter consisting of finely chopped fresh prawns on toast with sesame seeds, deep fried and served with fresh lettuce. 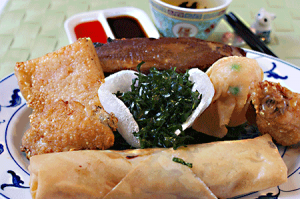 £8.20 拼盤(一 人) Deep Fried Combination Platter. A mouth watering starter consisting of spare rib, spring roll, deep fried won ton, sesame prawn toast, chicken wings and crispy vegetable. £5.50 云吞湯 Won Ton Soup. 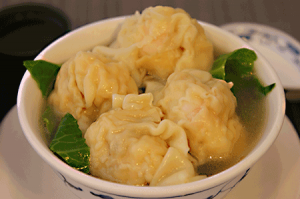 A delicious Chinese soup with minced pork & prawns wrapped in a thin sheet of pastry. £9.50 干炒牛肉絲 Deep Fried Shredded Beef in Chilli Sauce. Our Capital winning dish using lean shredded beef deep fried with finely chopped seasonal root vegetable with fresh spring onion, garlic, chilli sauce and a touch of wine. 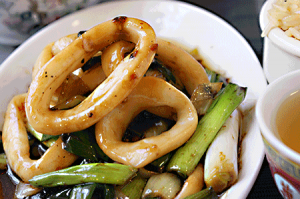 £12.70 姜葱鮮尤 Stir Fried Squid with Ginger and Spring Onion. A dish for an adventurer where fresh squids are flavoured then quickly stir fried with fresh ginger, spring onions, and a touch of wine. 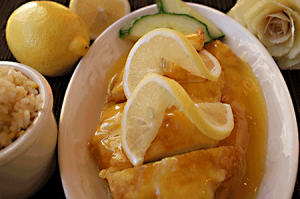 A favourite choice with our customers where deep fried chicken in crispy golden batter is served with homemade lemon sauce. 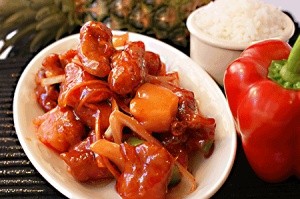 £9.10 古老肉 Sweet and Sour Pork (Cantonese Style). 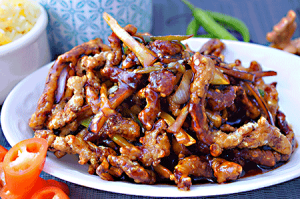 Succulent pork is prepared to retain the juice, then stir fried with green peppers, onions, pineapple and a sprinkle of wine. 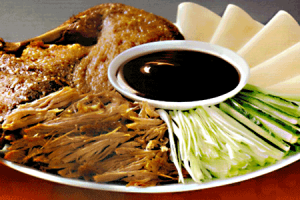 Duck is marinated for 3 hours before final cooking, and then served with Chinese pancakes, hoi sin sauce, finely chopped spring onion and cucumber. £9.40 什菜豆腐 Stir Fried Beancurd & Vegetables. 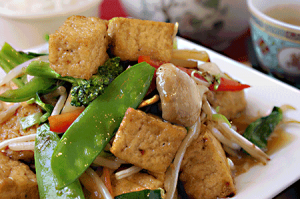 Stir fried vegetables with fresh bean curd in a light and tasty garlic soy sauce. 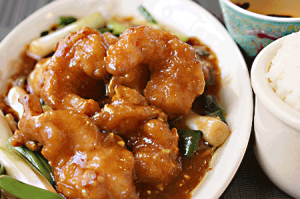 £15.30 炸京大蝦 Deep and Stir Fried King Prawns (Peking Style). Fresh king prawns are flavoured and then cooked with fresh garlic, ginger, spring onion and a sprinkle of wine for a fuller taste. 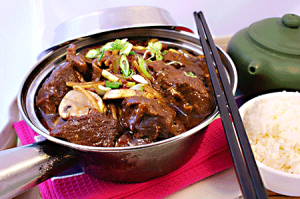 £10.90 牛腩煲 Beef Brisket Hot Pot. been talking about and enjoyed! 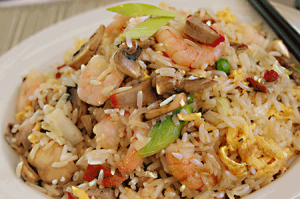 £11.50 招牌炒飯 “Golden Dragon” Special Fried Rice. This house speciality is served with fresh vegetables, char siu roast pork, prawns, sliced chicken and much more. 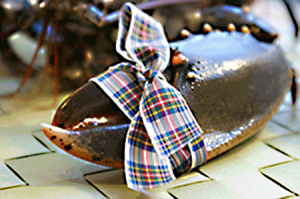 We do offer fresh local lobster or crab dishes which must be pre ordered.